Starting or expanding a business often entails undertaking costly and risky investments. In developing countries, where credit and insurance markets are imperfect, entrepreneurs face constraints on both fronts. It is well established that small enterprises are severely credit constrained (de Mel et al. 2008, Banerjee and Duflo 2014) and operate under high levels of risk, having to tackle frequent aggregate and idiosyncratic shocks (Samphantharak and Townsend 2018). While improved availability of credit and insurance ought to help aspiring entrepreneurs, the existing evidence shows that conventional microcredit has failed to generate substantial firm growth (Banerjee et al. 2015). In an environment where business growth requires access to capital and insurance against entrepreneurial risk, the ideal financial contract should cater to both of these constraints. In a recent paper (Battaglia et al. 2018), we study an innovative financial product that provides liquidity and reduces uninsured risk and examine which constraint is more important. To this end, we experimentally alter the debt contract terms by making the repayment obligation more flexible. Improved flexibility eases the credit constraint, as it allows for increased spending during the start-up phase, and provides insurance, in case of fluctuations in income. We conduct the randomised evaluation of the flexible contract in Bangladesh together with one of the largest microfinance institutions in the world, BRAC. The regular loan product BRAC offers has a 12-month loan repayment cycle with monthly instalments of equal size. By contrast, the flexible contract allows borrowers to delay up to two monthly repayments at any point during the loan cycle using repayment vouchers. On the day of their monthly repayment, borrowers can present a voucher, thereby postponing the repayment and extending the loan cycle. We primarily focus on collateral-free microfinance provided to women, where BRAC reaches four million borrowers in Bangladesh alone. Conceptually, repayment flexibility can both ease microentrepreneurs' credit constraints and deal with incomplete insurance. By delaying early repayments, the flexible loan can allow for a larger investment and larger loan size. We think of this as relaxing borrowers' credit constraints relative to the standard contract. Alternatively, borrowers can hold onto the vouchers and use them throughout the loan cycle, in case they face difficulty in making their payments. We think of this as providing borrowers with insurance, enabling riskier input choices or more experimentation in the firm as compared to the standard contract. To assess the effects of increased flexibility, we collaborated with BRAC to conduct a field experiment across 50 of its branches. After a baseline survey, BRAC offered the flexible loan contract to clients in 25 out of the 50 branches that we randomly selected. The same respondents were then resurveyed one and two years after the baseline. The experimental variation captures the relative benefit of the flexible versus the standard credit contract and allows us to study the importance of credit and insurance constraints. 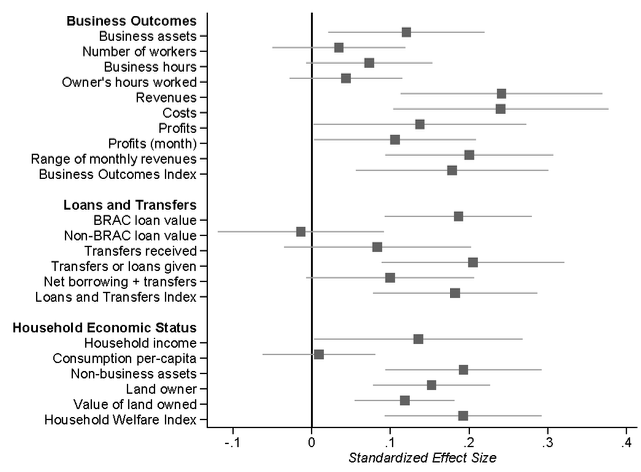 We find that repayment flexibility increases business investments and revenues. Our estimates reveal that the value of treated borrowers’ business assets is 51% higher relative to the control group. They generate 87% more revenues, have 25% larger profits, and experience 80% higher sales volatility. Borrowing from BRAC goes up by 15% compared to the control sample. At the same time, they extend more loans or transfers to their social networks (74%). In terms of their socioeconomic status, they end up with higher household income (17%), more household assets (25%), and own more land (26%). Figure 1 summarises our findings by plotting the standardised treatment effects and 90% confidence intervals for the outcomes of interest. A natural question is whether these improvements came at a cost to the lender in terms of default rates. We find that the likelihood of default diminishes among eligible microfinance clients (35%). Moreover, they are more likely to remain as BRAC borrowers. When we explore the mechanisms that enabled clients to expand their business activities, we find that the results are driven by an increase in entrepreneurial risk taking, implying that the primary channel is insurance provision. 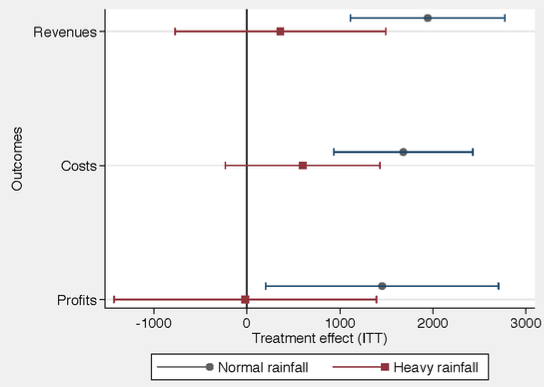 We first study the voucher use pattern among clients in treated branches. We find that usage is dispersed over the loan cycle, with a substantial proportion of borrowers not employing any voucher despite taking up the flexible contract: 60% spend at least one voucher and of those that use both, 3.3 months pass between the first and second voucher. Importantly, only 1.6% employ them in months 1 and 2. This is more in line with state-contingent insurance, where vouchers are used if needed, rather than easing a credit constraint by exhausting the vouchers immediately to boost investment and loan size. We then investigate if the flexible contract increased risk taking. We begin by comparing the distribution of earnings in the treatment and control samples. We observe that treated households in the left tail of the distribution experience lower revenue and lower income growth relative to the control group, while they do better in the upper quantiles. Figure 2 demonstrates this by plotting the quantile treatment effects on household income. The estimates reveal that while most treated clients increase their business revenues and household income, those at the lower end of the distribution do worse relative to the control group. This is consistent with flexibility leading to greater risk taking, causing some entrepreneurs in the treatment group to lose out (relative to control), while others gain. Overall, higher sales volatility without increased default rates, vouchers used at distinctly different points in time or not all, and a shift toward activities more exposed to demand uncertainty are findings that speak to the importance of imperfections in the insurance market for entrepreneurial risk. 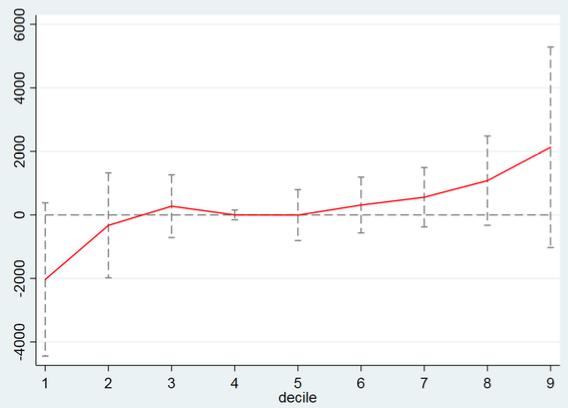 Finally, we consider how the new contract affected the selection of individuals into borrowing. In particular, we test if the introduction of the flexible loan attracted different types of firms in treated branches relative to control. To do this, we conducted a census of small and medium enterprises (SMEs) operating in the 50 branches at baseline, surveying a random sample of the SMEs prior to randomisation. We then compare, within this representative sample of SMEs, whether those borrowing from BRAC in treatment branches at follow-up are significantly different in terms of their baseline characteristics. We find that entrepreneurs who were less risk averse and who expressed a desire to start a new business were more likely to become BRAC borrowers in the treated branches. While the new clients were not part of our loan product evaluation, this suggests that the flexible loan has important selection effects, primarily attracting clients interested in growing their business activities. Taken together, repayment flexibility provides a simple but novel way to spur innovation and entrepreneurship among the poor. From a policy perspective, the contract is a cost-effective financial product that promotes business outcomes by insuring against entrepreneurial risks. Banerjee, A and E Duflo (2014), “Do Firms Want to Borrow More? Testing Credit Constraints Using a Targeted Lending Program”, Review of Economic Studies 81(2): 572–607. Banerjee, A, D Karlan, and J Zinman (2015), “Six Randomized Evaluations of Microcredit: Introduction and Further Steps”, American Economic Journal: Applied Economics 7(1): 1–21. Battaglia, M, S Gulesci, and A Madestam (2018), “Repayment Flexibility and Risk Taking: Experimental Evidence from Credit Contracts”, CEPR Discussion Paper 13329.
de Mel, S, D McKenzie, and C Woodruff (2008), “Returns to Capital in Microenterprises: Evidence from a Field Experiment”, Quarterly Journal of Economics 123(4): 1329–1372. Samphantharak, K and R M Townsend (2018), “Risk and Return in Village Economies”, American Economic Journal: Microeconomics 10(1): 1–40. In the paper, we also show that the effects on revenues and profits are driven by borrowers in locations where expected demand uncertainty is higher at baseline. To measure average demand uncertainty in a given location, we rely on subjective probability distributions of expected demand using a representative survey of firms.